Lee's Boston Drum Builders Blog: What Can Shellac Do For You? What Can Shellac Do For You? 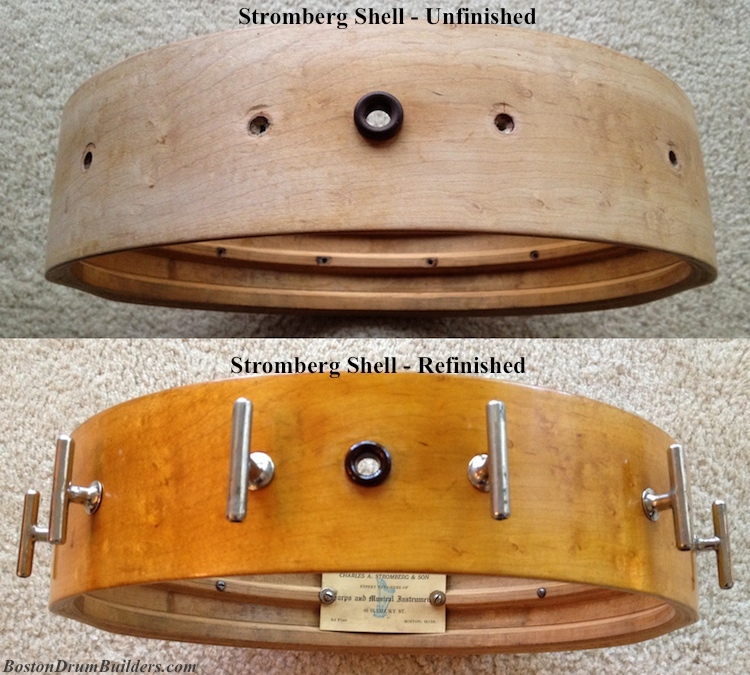 Refinishing the 1920s Stromberg Invincible Orchestra Drum proved to be a significant undertaking, but it was an enjoyable one none the less. Before touching the shell with any new finish, I did my homework as I wanted the new finish to be as authentic to the original as possible. I came to learn that shellac was the wood finish of choice during the early 1900s, and with a little testing of the old finish (what was left of it) it was determined to in fact be shellac. So I set out to find a type of shellac that would most closely match the original. This proved to be a real learning experience! All shellac is not created equal, I soon realized. While shellac is often sold premixed today at big box hardware stores, I wanted to be able to control how fresh the shellac was, and exactly what grade of shellac would be used. Dried shellac (the material dissolved into alcohol to make the liquid finishing product) comes in a couple of forms including flakes and 'buttons'. My original assumption was that the lightest available grade, a.k.a. "blond", would be the one to use. But after testing it on some scrap maple, it was apparent that the blond shellac imparted no color at all to the wood and would not come close to matching the original finish. More research was needed. I came to learn that blond shellac is a highly refined product which is filtered, bleached, and de-waxed to achieve this almost completely clear color. What I needed was something closer to the original which was likely "orange" shellac still containing its naturally occurring wax. After testing and comparing four more samples of shellac, we had a winner! Seen above as letter 'D', it is the purest, most unrefined form of buttonlac (that would be raw shellac in 'button' form) I could find. And what do you know, when dissolved in alcohol and applied to maple it looks shockingly similar to the finish on all the early 20th century snare drums on my shelves! I chose to apply the shellac with a pad made from linen wrapped around part of an old athletic sock. Padding the shellac, which dries very quickly, helped avoid brush strokes and runs. The job I did is far from perfect, but at first glance it really does look like the original finish! The color turned out being a very, very close match so I am happy about that. The hardware is polished now, and the lugs are back on the drum looking much more shiny than before. All we lack at this point is new calfskin heads which I will tuck to fit the drum. More pics to follow once the project is complete!